Back in 2014, I played a show at Garfield Artworks with Guillermo Pizarro, Christopher Feltner, Stephen Palke, and Ali & the Haitians. I don't remember much about the show. Recently, in the last month or two, I saw that Guillermo Pizarro had released a new album that seemed to be semi-blowing up across the noise groups on Facebook or at least was being talked about by various friends in "the scene". I figured I'd check it out. The cover art of Harmonic Poems brings the viewer to a strange barren cabin room, the kind that might exist in a modern horror film. There is a focus on the strange chair, perhaps the seating for a garrulous ghost. It's quite a bleak, ghastly image and a good display of what will be heard when the musick is set in motion. 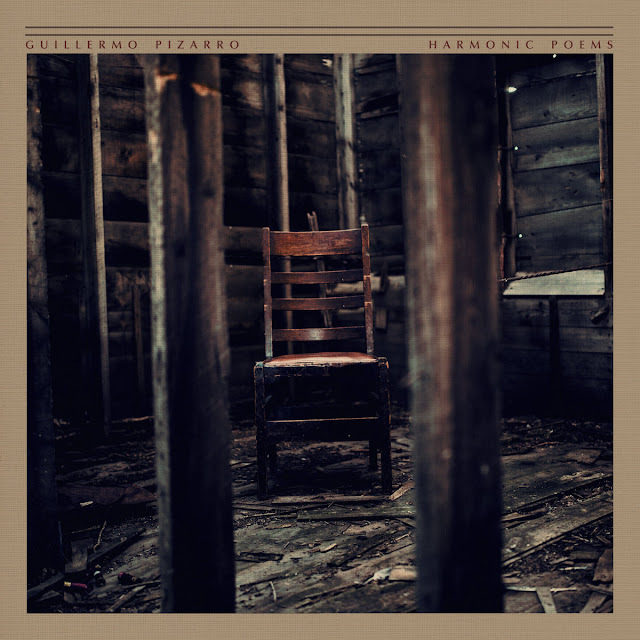 Harmonic Poems starts with "My Guest", sounds the crackling of wood, the invitation to a dark house as pictured on the cover. It is a slow burn, erupting into booms and crashes that sub-octavely pained me to listen to. I had to take off my headphones to hear all the creaky, creepy sounds without like losing my hearing. This track is still incredibly painful and probably damaging to speakers. It's certainly going to an interesting level, but I kind of don't like it for the levels it goes to. The next track, "A Room With A View", scares me. The high-pitched tones and strange screeches made me fear what might come next, but then it just stopped. There were just the sounds of typing or rattling shutters or clicking buttons and switches before the tones returned with more monstrous sounds too. And then everything stopped, and a voice spoke amidst explosions. The voice creeped me out, talking directly to me. I really felt scared. It was dark at night, I was alone in my house, and I almost gave up listening to the album right there. I'm glad I toughed it out. "Aokigahara" has a different kind of space. It is still a scary space filled with the murmurs of the unliving surrounded by rattling bells, but this one is not claustrophobic. There is air to breath, maybe at the risk of one's health, and there is a space to get lost into. It's really not a good place to get lost though - Aokigahara is the suicide forest of Japan. It really isn't good for your health to be there. The creaking sounds, lost violins on the winds of the damned, build as the track goes on. I became afraid again. "Aokigahara Pt. II" features more violin, more cries, and rain. The violin provides more of a song than before, but the samples are a little much. The cries, which become somewhat annoying by the end, and the storm, drown out the sound of the violin. I don't think it works particularly well. "Wind Horn (Kaze no Denwa)" recalls another morbid Japanese cultural artifact - a disconnected rotary phone on the shores of the Pacific Ocean to call to those lost in the tsunami of 2011. This track was interesting but the harsh noise blows everything out again. It kind of works here, but I feel like it is strange to use these types of sounds when referencing something solemn like that. I really like the droning sounds that go thru the rest of the track; I wish that was the main focus. When this track ended, I became acutely aware of the fan blowing in the other room. It seemed so loud all of a sudden. I quickly went back to focusing on the album, somewhat unnerved again. "13 Years - Deep Creek Blues" is the final track. It starts with one or more field recordings, seemingly someone walking through a creek bed surrounded by animals and flies. The same voice from earlier begins to talk, very low and rough. The man says something about going down to the creek, but it's hard to make out the rest amidst all of the other sounds. I don't particularly like the separation of the sounds, obviously sourced from multiple sources. The voice sounds so robotic; of course, that's kind of the big reveal I guess. The track ends in a flood of Iommi-esque guitar and black metal vox. Harmonic Poems is really an interesting album. It really does try something experimental. There is a narrative, but it doesn't consume the entire album. There are a lot of different sounds in relatively few tracks as well, ambient to metal to harsh noise. Unfortunately the production gets in the way. I didn't like the harsh, blown-out, digital sound of the various samples and effects used. It felt claustrophobic and somewhat jarring with the rest of the track, though on "A Room With A View", it helped create a particular fear. The levels seem off to me; it's hard to hear various sections that seem important. I did enjoy the album, though I also find it hard to listen to. Harmonic Poems tries something different; I don't think it is totally successful, but it made a good effort. Harmonic Poems gets a Good.